Mrs. Awesome's people are from Texas... central Texas, and in central Texas, they take the recipes brought over by forebearers and give them the Texas twist. Bieroux are a traditionally German recipe, but now it's a Texas German recipe. 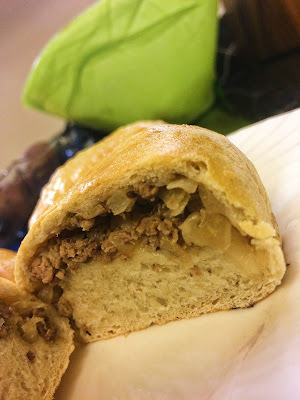 These hot, stuffed buns are filled with ground beef, sauerkraut, herbs and spices. Using the bread dough you have in the fridge, all you need do is fry up the filling, stuff and bake them. Serve them piping hot out of the oven with mustard, and it's a meal you're going to love! And they are versatile too. You can fill them with just about anything, sauteed vegetables, BBQ, or ham and Gruyere cheese, to give you some ideas. 1. Remove the dough from the refrigerator and allow it to warm on the counter. 2. Mix the spices and set aside. 3. 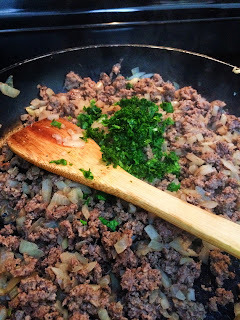 Add the ground beef and onion to a large skillet over medium-high heat, saute until the meat is nearly cooked through, then add the herbs and spices. Add the sauerkraut and allow the meat to finish cooking. Set the pan off the heat and allow it to cool while you portion the dough. Preheat the oven to 350F. 4. Using a kitchen scale, measure out 2 ounce portions of dough. If you haven't a scale, halve and halve again the balls of dough until you have a total of 16 pieces (We ended up with 17, which is a nice, even number, because Mr. Awesome guesstimated what 2 lbs. of dough looked like). Roll each piece into a tight ball and allow them to rest for 5 minutes before rolling them out. 5. Using a rolling pin, dusted with flour, roll the 2 oz. dough ball out into a 6" circle, roughly a 1/4 inch thick. 6. 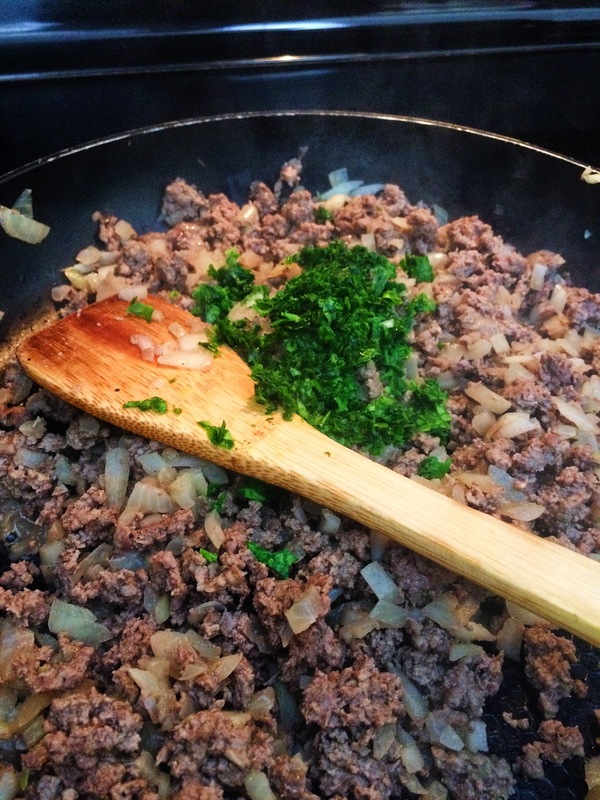 Scoop about 1/4 cup of the meat mixture into the center of the dough, draw up the edges and pinch them together tightly. Flip the bieroux over, round it with your hands, and place on a parchment paper lined sheet pan. 7. Repeat the process for the remainder of your bieroux, leaving an inch or so between them to bake. 8. Once you've made all your bieroux, brush the egg wash over the tops and sides of the bieroux. The egg wash will give them that beautiful glossy finish. 9. Place in the 350F oven and allow them to bake for 35-40 minutes until golden brown and a thermometer reads an internal temperature of 180 degrees Fahrenheit. 10. Remove from oven and allow to cool on a rack for 5 minutes before serving. Mustard and horseradish are excellent condiments. Bon Apetit y'all! Leave a comment and let us know how they turned out.